Zen and Japanese Culture is a classic that has influenced generations of readers and played a major role in shaping conceptions of Zen's influence on Japanese traditional arts. In simple and poetic language, Daisetz Suzuki describes Zen and its historical evolution. He connects Zen to the philosophy of the samurai, and subtly portrays the relationship between Zen and swordsmanship, haiku, tea ceremonies, and the Japanese love of nature. Suzuki uses anecdotes, poetry, and illustrations of silk screens, calligraphy, and architecture. 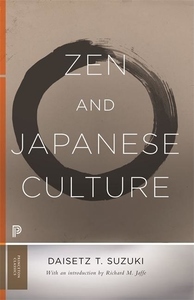 The book features an introduction by Richard Jaffe that acquaints readers with Suzuki's life and career and analyzes the book's reception in light of contemporary criticism, especially by scholars of Japanese Buddhism. Zen and Japanese Culture is a valuable source for those wishing to understand Zen in the context of Japanese life and art, and remains one of the leading works on the subject.